Bee Rediscovered After 99 Years! One of Australia's rarest native bees is a 5 mm long red-brown species called Homalictus rowlandi. It had not been seen since two specimens were collected in 1902 by Turner in Kuranda, north Queensland! was fine. Ken left his family in Kuranda and explored a road through a rainforest, looking for bees feeding on the rainforest flowers. He found some really good Ligostrum lucidum flowers and patiently caught bees and examined his finds from 10 in the morning until 3 pm. At last it was time to go back but Ken decided to try just one more time. He looked at his catch and suddenly he saw it. `You beauty!' he shouted. He recognised it immediately - it was another Homalictus rowlandi! Ken's journey from Melbourne to north Queensland and back had taken five weeks and covered 13,000 km but he considered the effort most worth-while. 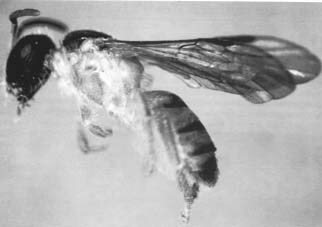 He had rediscovered one of Australia's rarest native bees - Homalictus rowlandi, the bee that had been lost for 99 years. from Museum Victoria, was intrigued by this species and longed to find it once again. The only existing specimens of this rare species were held by the British Museum in London. Ken discovered that these bees had unusually large ocelli (the three simple eyes which are located at the top of a bee's head. An Amateur Bushfoodie about our garden. Your courage has given me the courage to face whatever the future has to offer me and to put our future plans into operation. I will further develop our native garden. I will continue our involvement with the Bushfoods Association. I will split our native bee hive this spring, build more bird boxes, care for the frog pond, continue with your habitat history and attend to the many chores which we once did together. You will always be beside me. While I mourn your passing, I know that this earth is a better place from your presence. Many people and creatures have breathed easier because you lived. You have brought love and laughter and kindness and comfort to many during your stay with us. You have won the affection of many and you were respected by all who knew you. Rob Reason dedicates this tribute to his wife Denise who passed away in March after a year-long battle against cancer. Denise and Rob were foundation members of the Queensland Bushfoods Association (Member 23). I found my one love, Denise Jorgensen, when we were both students at Brisbane State High School in the mid fifties. We fell in love, married in our teens, and raised seven beautiful children in our forty five year partnership. In 1976, we settled on suburban acreage at Everton Hills. Here, with my help, Denise established a native garden which eventually focused more and more on native food plants. Denise found that many Australian native fruits, nuts, greens, roots, leaves, shoots and aromatic herbs have tantalizing, unique flavours that offer new and delicious taste sensations which enhance the quality and bounty of our country's cuisine and produce. She became an advocate for them in her quiet but resolute way. Her garden did not grow willy-nilly. She created a garden that is a self-sustaining ecosystem, a garden where she did not have to water, weed, artificially fertilize or use poisons. Each specimen was carefully selected after scrupulous research.She considered soil type, moisture requirements, light needs, leaf fall and root system. She loved giving her visitors and friends plants from her nursery to take home, or some of the exquisite jam which she made from her own produce in her own kitchen to her own recipes. She was especially thrilled last Christmas when the Bushfood Association organised two field days in her sanctuary in Bunya Road. Though close to death she proudly led her visitors through her pride and joy. Denise made her last planting two months before her death. She was delighted with the result. "I have dirt on my hands and feet once more. ", she exuded with her beautiful smile. But it was the last time she ventured into her wonderland of nature. Hence forth confined to her bed (she wanted to die at home) she was content to hear the bush sounds - something denied her in the sound-proofed, sterile hospitals which she hated. To her one of the exciting things about growing plants from seed was the inherent chance of difference. Whatever their condition she allowed her plants to grow at their own natural pace with grace. She also acknowledged that sometimes some beautifully flourishing specimens died for no apparent reason. I am sure this allowed her to come to terms with her own mortality. Denise is now at peace in the garden she so lovingly created and nurtured. Her ashes were scattered beneath a favorite tree (Elaeocarpus bancroftii). Whilst sharing with like-minded amateurs the story of its sweets, its delights. Now, amateurs are lovers, sure and true. Her love was steadfast for her friends, her man, her family, and all those other stewards of the wild she cherished, preserved to know. But love's labour is not ever lost, with every effort yielding manifold returns of fellowship and valued trust. There is no fear for her now in that unspoiled environment of endless love, joy, peace. Although this book was written with the Redland Shire (SE Qld) in mind, it has much to recommend it to anyone living in a mild temperate or subtropical area. The first sections deal with indigenous plants in general - cultivating them, designing with them and caring for them. The following chapters look at specific plants for specific areas - dry sandy soils, rainforest, littoral, etc. Then, to me, comes the interesting parts - stacks and stacks of suggestions on theming your garden - for wildlife, colour, shade, specific use etc - my only complaint being there is no section on edible natives! This is not a great draw-back as the book includes a good array of bushfoods. There are many good colour plates and some delightful line drawings. If you're thinking of turning your garden 100% native - or you'd simply like some ideas on plants to add, this book is for you. This would have to be the best reference booklet I have come across in a long time. Although I can't grow Quandong where I live, if I could, this would be one of my bibles! Gordon-Mills has done her research over many many years - and it shows. The booklet covers everything from nomenclature to Aboriginal and settler use, the current state of the Quanding industry and supply/demand. a major component - but we really don't know what proportion of the industry it represents. The mid section of the book synopsises Quandong research and trials undertaken to date. The final section covers pests, propogation, breeding and future development, with an extensive bibliography. Level 1, AMA House, 42 Macquarie St, Barton, ACT 2600. Are you growing Australian Bush Food Trees? For initial establishment and yearly maintenance, use Alroc mineral fertiliser, a new Queensland based fertiliser for superior growth results. This is for any area in Australia. Alroc is a blend of crushed volcanic Basalt, Granite, Dolomite, Bentonite, Rock Phosphate, Rock Potash and Bio Coal Fines, chosen for their mineral content. The Bio Coal Fines have been composted for 10 years and are added as a dry, micro-fine dust to provide carbon for our soils in the form of organic matter. It is being used with superior results by farmers all around Australia, Tasmania and New Zealand. Your bushfood crop is a product of your soil type which supplies all the minerals for your tree growth and fruit. Alroc is Certified Organic by the Biological Farmers of Australia (BFA). Applying rock dust to the soil is not new. Lime, dolomite and gypsum are all commonly used. Alroc takes this traditional farming technique to a new level of sophistication, with the blend of rock types in the mix and a prilling process to make for ease of application with any spreader, hand or mechanical. Since soil forms from rock in the first place, poor, or overworked soil can be improved by adding specific types of rock-dust chosen for their mineral content. The volcanic Basalt, Granite, Dolomite, Rock Phosphate, Rock Potash and Bio Coal Fines in Alroc, slowly releases a complete spectrum of minerals and trace elements. Micro-organisms decompose rock-dust from the surface of tiny Alroc particles and combine this with organic matter to form humus. The rejuvenated soil supports an enormous variety of soil organisms, some of which capture nitrogen from the air and make it available to plants. The plants grow nutrient-rich and withstand pest and disease infestations much better. Because the plants develop an extensive feeder root system, they are also better able to withstand dry spells. By utilising the soil organisms, Alroc uses a natural renewable energy source to process nutrients for plants. Sustainable farming makes use of on-farm resources and natural biological processes. There are two types of bushfood trees: they do not take a lot of fertiliser. Some bushfood trees thrive on carbon and some don't. Recommended Alroc varieties are No. 3 or Extraphos & Potash. Growth is basically dependent on the varieties of trees which a soil test will sort out. A soil test of the type we can arrange, costs $150.00 if you can send us some samples. I believe this range of fertilisers can be of use to you in the establishment and maintenance your Australian Bushfoods plantings. Phone or e-mail for any further queries. Address: 1606 Chambers Flat Rd. Combine all the ingredients and bring to the boil. Simmer and reduce to thicken. Strain out the wattle grounds and freeze for other applications eg. as a crumb substitute over meats. Finish the sauce with cold butter or cook in a corn flour slurry for the required consistency. Boil the wattle in the water and remove pan from heat. Add the Marsala and sugar syrup, mix and leave to cool. Line the bottom of an appropriate dish with half the biscuits to form an even base. Strain the wattle syrup and pour half over the biscuit base leaving to soak in. Alternatively, quickly dunk each biscuit before laying them out. In a double boiler, cook the eggs, sugar, rum and Marsala until thick. Cool over ice until cold. Whisk the marscapone cheese until stiff and gently fold into egg mixture. Spoon half over the wattle soaked biscuits, sprinkle on some of the finely grated chocolate then spread out another biscuit layer and drizzle the remaining wattle syrup over the biscuits. Add more grated chocolate and the remaining cheese mixture and finish with powdered cocoa.